Very Very Vicky: Jing-a-ling on Over for a Great Idea! It's a wonderful time of year full of beautiful decorations, parties, Christmas trees and yes, presents! It's hard to keep secrets even from adults--especially when you have the perfect present for someone special...and it's especially hard for the littlest family members to resist the impulse to have a peek just a little early! Just like all self-respecting kids, they are curious and excited. 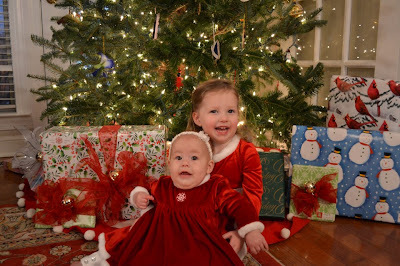 Even Charlotte who cannot crawl yet has been found inching her way toward the tree with a little hand reaching toward the colorful boxes! Kristen, their mom, came up with a great solution--she had some extra jingle bells left over from another project and she tied them on the gifts! Simple but ingenious! Now when Ella takes a notion to rearrange the presents or little Charlotte wriggles her way off the tummy-time mat, a jingle bell rings to notify the powers that be. Then a gentle reminder helps to preserve the surprises until the right time--after all, half the fun is in the anticipation! 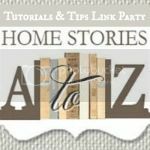 I'm sharing this idea over at the link party at Home Stories A to Z! Have a look at all the other great projects being featured! That is not only smart, but such a pretty and festive way to wrap gifts! I love it!! Lol--I guess she knows the tricks of the trade and how to counter them--no sneaking and peeking at her house!